No two autumns look the same — not even in the northeast, famed for its brilliant fall colors. The factors that affect how the leaves change are many, but temperature, soil moisture, and exposure to sunlight are most influential. Drier, sunny fall days followed by cool nights make for the best fall color shows, but why? Much of the answer lies in the way these conditions affect the pigments in leaves and how they’re revealed. Two of these pigment types, chlorophyll (green) and carotenoids (yellow and orange), are present in leaves throughout the year. Chlorophyll masks the carotenoids until autumn, when trees begin to block nutrient transport to leaves in preparation for winter. Because chlorophyll is quick to decompose when exposed to light and must be replaced throughout the active growing season, it diminishes once this process begins, eventually running out. In its absence, other colors are revealed, namely the yellow and oranges of carotenoids. Weather-wise, bright days speed the breakdown of chlorophyll, thus revealing these fall colors sooner. Drought stress during the growing season, though, can trigger trees to block nutrients to leaves earlier in the year, causing trees to drop before chlorophyll is depleted. Though carotenoids need not be produced for autumn color, how and when they’re revealed is affected by these weather factors. Unlike carotenoids and chlorophyll, a third pigment important to fall color is generally absent from leaves during the year, produced actively only in the fall as trees ready themselves for winter. Called anthocyanins, these pigments are responsible for the truly show-stopping reds, purples, and blues of autumn, seen in trees such as black gum (Nyssa sylvatica), sugar maple (Acer saccharum), and sourwood (Oxydendrum arboreum). Not all trees make anthocyanins, though, and the ones that do require particular conditions in order to do so. Anthocyanins are produced from excess sugar in the leaves, trapped as nutrient transport slows. Abundant sunlight is required for anthocyanin production, so a dreary, grey autumn will result in a color display less stunning than that of a sunnier season. Temperature affects anthocyanin production as well. Though cooler nights help to trap sugars in the leaves, freezing temperatures destroy the mechanism that produces the pigment. An early freeze, then, may mean a dull display. Of course, no matter the weather conditions, many tree species don’t produce anthocyanins at all. 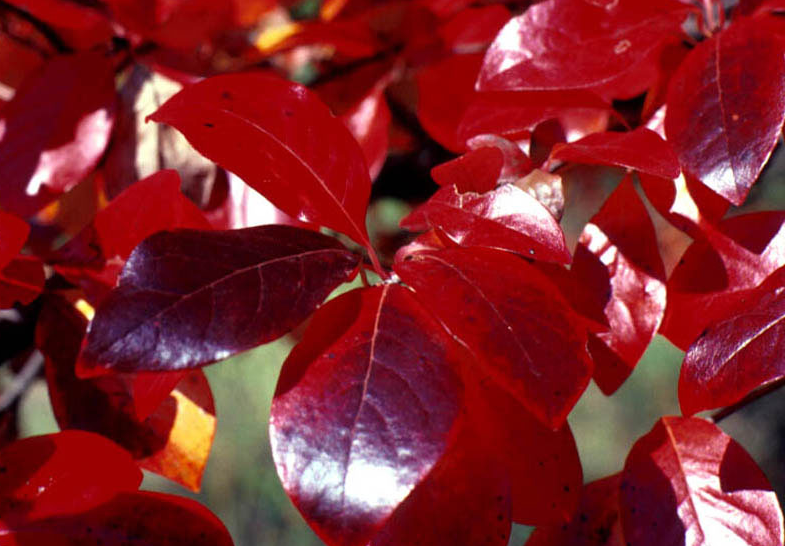 In temperate regions, anthocyanins are thought to be present in about 10% of tree species. It’s not surprising that parts of the northeast are so well-known for spectacular fall color — as many as 70% of tree species there may produce these red and purple pigments!